Hello everyone, today I’m going to discuss wader options for the fisherman. In today’s market out there we have the inexpensive waders such as nylons or the PVC waders which are going to be your lowest clot and price option. The major disadvantage of these waders is that they tend not to last very long, they break down very rapidly in most situations. They are also very easily punctured and they just wear out fast. So, our focus todays on neoprene and breathable waders. We will discuss pros and cons of the two. And offer you the best choices as a fisherman. Neoprene was the hot item then they first came out on the market, it was 25 years ago and they were 3 times as expensive as they are today actually. They’ve come down drastically in price mainly because the demand for neoprene waders has gone way down with the advancements and the price reduction in breathable waders. Breathable waders is made from a fabric that allows water vapor to escape through the membranes of the wader but yet will allow a larger water molecule to penetrate into the wader, therefore they are waterproof. Modern breathable waders have zippers that are actually waterproof, don’t ask me how it works, but they actually do work because I have seen them and used them and they really are waterproof. Now neoprene wader is just what it sounds like, wader that is constructed of neoprene rubber. All the modern ones are now lined on the inside as well as the outside. Most people have been hunting for neoprene for a while now, that is what they are used to now, way back when they didn’t have this material people wearing canvas waders, they were way worse and not warm at all also very difficult to move in. The ones that came out first were not lined in the inside and they were extremely uncomfortable if you wore them in a hot situation. The lining inside makes them a little bit more comfortable when the weather is warm. 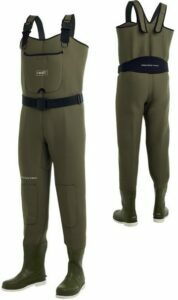 Neoprene waders are recommended for very cold-water environment. For example, if you are going to Alaska where the ambient temperatures not going to exceed about 60 degrees, it’s going to be rainy, the water is glacial melt-water so it’s very cold. That is in a situation where the neoprene wader is your best option. Or if you are going float tubing for instance or kick boating and you are going to be mostly submerged in the water in a very cold water environment, maybe you are going to a lake as the ice is coming off of it – neoprene is your best option in such situations. Warmth – it’s the top advantage comparing to other waders, especially over breathable ones. Neoprene is made to keep all your body heat trapped inside. There are various thicknesses and you should choose one that suits your needs best, it depends on the temperature of the water, thinnest generally is at 3 millimeters. No other waders can outperform neoprene for keeping you warm in terms of time. Mobility – as you know neoprene is used in various suits, and diving suit is no exception. Fabric is formfitting and this makes it good for easy mobility. Neoprene is also a highly buoyant which is a huge ting for float tubing. Longevity – neoprene waders will outlive any other type of waders including breathable ones by a long shot. The durability of this material allows the waders to last for at least 20 years. If you compare to breathable waders, they last only 5 years according to polls and answers from consumers. Neoprene can be repaired without a lot of hassle, for example if a hook rips a hole being the water – instant bonding superglue will do the work. 100% waterproof – you can be sure that no water will come in if you use them. To get this result you have to sacrifice one thing – they are not breathable but will keep you warm even in coldest water environment. Neoprene is a great material to paddle sports. Occasionally you may need to fix a hole rip in the fabric. In this video you can see how to do that. Today you can find a lot of choices of wader material, but neoprene is still widely used by fisherman and other people who need a trusted protection from cold in their activities in water. We listed best neoprene wader options for you to consider, from simple chest ones to hip, and hope that you will make a wise choice and will not regret it.